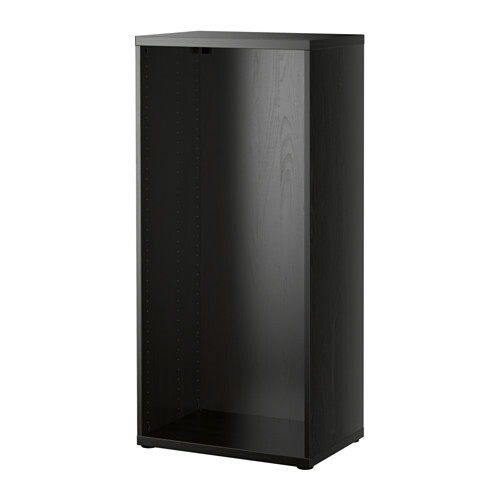 My statue display is based on the BESTÅ (or BESTA) cabinet system from IKEA. It’s a somewhat modular system that can be combined in many ways to create a display system that suits your needs. For the ease of my international friends that may not have the letter “Å” on their keyboard – or don’t know how to pronounce that letter – I’ll simply call it “BESTA” throughout this article. Important note: My BESTA frames are an older version. 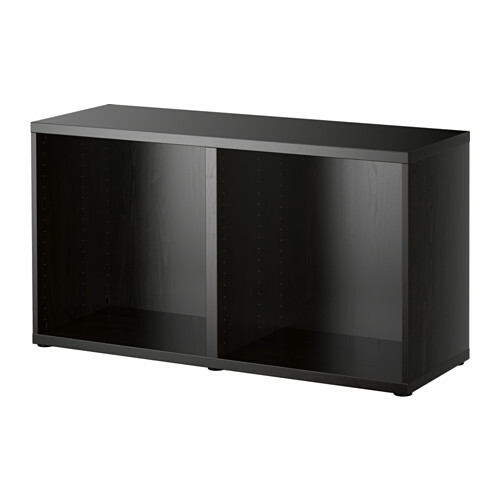 I am quite sure that IKEA still offer the BESTA frames, but the measurements may be slightly different and so may colors of the current versions. I have provided article numbers further below for each unit/item that I believe are similar to the ones I got. These numbers may be changed from time to time – if so, please let me know so I can keep this article up-to-date. BESTA comes in different sizes. You can combine these sizes almost seemlessly. That’s what I have done in my display, and I think this sometimes confuses people since it’s not that easy to see what sizes I have actually combined. To make things understandable, let’s imagine that the above specs is a standard BESTA frame. Basically what you can see in the image to the right. So, let’s break down what I got. The above picture is a few years old, but it’s the same display. I just didn’t have that many statues back then. I’ve added some lines that illustrate the individual BESTA frames that I have set up next to each other. A: On the far left is a low twin i.e. 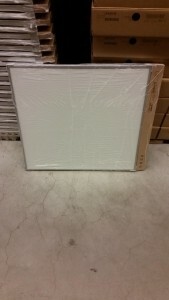 it’s 1/3 in height but it is double the width of a standard BESTA frame (47 1/4 ” or 120 cm). The article number is: 502.459.53. Price: $60. B: This is a twin standard i.e. 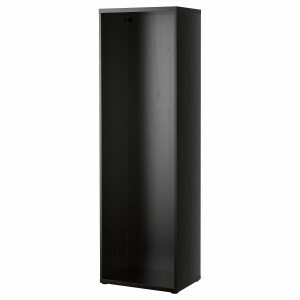 it’s full height, but twice the width of a standard BESTA frame (47 1/4 ” or 120 cm). 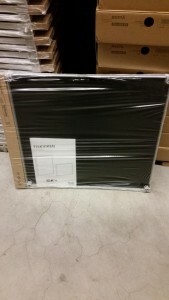 Since I am not able to find this frame on the IKEA website, I believe this to be discontinued. IKEA does, however, list storage combinations that are identical in size to this. They simple have exchanged the twin model with two standard BESTA frames. This is most likely because IKEA wishes to streamline their models and not manufacture a model that is essentially just two standard frames put next to each other. Therefore, this is the article number for a standard frame: 902.459.46. Price: $75 (or $150 to make up for a twin). C: This is an actual standard frame. In terms of width, this seems to be the only size that IKEA offer today. Once again, the article number is: 902.459.46. Price: $75. D: Finally, we have a medium sized frame (2/3 of a standard frame in height). This has article number: 402.459.44. Price: $70. Total price (in US dollars): 60 + 75 + 75 + 75 + 70 = $355. Let’s not beat around the bush. The glass doors I am using have been discontinued by IKEA! They are called TOMBO. The only way to get them today is by purchasing them second-hand. It is a huge shame since I find them to be beautiful. Especially for statue displaying purposes. I believe a reason that this happened was that ordinary consumers (and I say this with an attitude!) disliked the fact that you were able to see the door mechanism due to the thin profile of the metal frame. They were also very expensive, mind you. 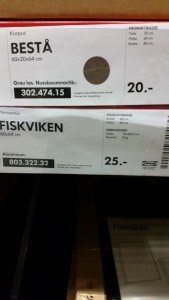 Here in Denmark they were priced at DKK 300, which roughly translates to $45 for a single door! I have 12 doors so that’s $530-ish just there. More than the total price for the frames! GLASSVIK: This door more or less was released at the same time that IKEA discontinued their TOMBO doors. So one could call it the successor to TOMBO. It features a thicker painted profile. GLASSVIK (the black frame and clear glass) has the following article number: 302.916.58. It appears that Tombo are coming back under a new name: “Fiskviken”. Check out your local IKEA in the near future. This report comes from a German IKEA. I use an integrated lighting system from IKEA called INREDA. Again, it would seem like these specific models are no longer being made by IKEA. However, they still offer various integrated lighting systems that can be used in combination with BESTA. So just look for what they’ve got, or ask them in the store. There’s not much to it, really. With the INREDA system you can connect multiple sets to each other, thereby expanding the number of lights that turn on/off using the same single switch. Each package contains all that you need to do this. So don’t worry about that. I’m certain that all new variations of integrated lighting offer the same in this regard. Warm or neutral light (yellow or white)? Light strips or single point of origin? TIP: If using a single light source per case, I recommend placing the light toward the front of the case (closer to the door). This will cast more light on the front of the statue. Depending on the pose of the statue you can also move the lights to either of the sides to optimize its effect on the statue. It’s pretty easy to move the light around later, but you might as well try and get it right from the start. Important note: Always use LED lights! They can burn for hours and hours whilst emitting only a minimal amount of heat. This is important since the heat can have a deteriorating effect on your displayed objects – statues in particular. I use a warm light since I find that it looks more cozy and gives my living room a nice atmosphere. You can basically choose to have your frames standing directly on the ground without legs, or you can buy legs separately. I prefer the use of legs since this makes it possible to run cables and what-not underneath your display. It simply makes life easier. The ones I got are cylinder and made of metal. Don’t recall the name, and I can’t find them on IKEA’s website. Again, they might have replaced this model with something else. I suggest asking someone in the store. I think I’ve covered almost everything now. As a statue collector, I hold much love for IKEA. But it is a real shame that they have chosen to discontinue many of their previous products. But they rarely do so without introducing a replacement instead. So, the options will always be available to us, but they may change their appearance and form over time. I therefore recommend that you think ahead, and think carefully on how you wish to design you display. Actually, when I got my display, I started without the medium-sized BESTA to the far right. However, I soon realized that my Iron Man bust felt cramped inside a case, and I decided to add the entire unit to the right, and placed the bust on top of it. I did that only a few days after buying the other frames. If I had waited for too long (we are talking more than a year) I might not have been able to get the same legs or the glass doors (or maybe even the same color frame). So act with due diligence. Take measurements, draw a sketch, and think about what pieces you plan on putting on which spots. It’s actually a pretty fun process. I hope this article will provide you with a solid foundation. If you have any questions, do let me know! Oh, and before we go… Feel free to check out this video. My most recent tour of my display. Enjoy! Wow! Super great article…i am a retailer in Canada and will share your post with my 3000+mailling list. You give me hope for a new replacement for the Tombo door…there was a petition started in canada to have ikea remake them. My pleasure, Dan! Thanks for sharing it! I want my article to help as many people get answers and inspiration as possible so it’s a great help. Thank you. Thank you, this helped allot. Very nice. This has to be the best article I’ve seen regarding display set ups. I already have several Detolf cabinets for my 1/6 scale figures and have been searching for the best option for displaying my 1/4 scale statues, with the ability for expansion and lighting. 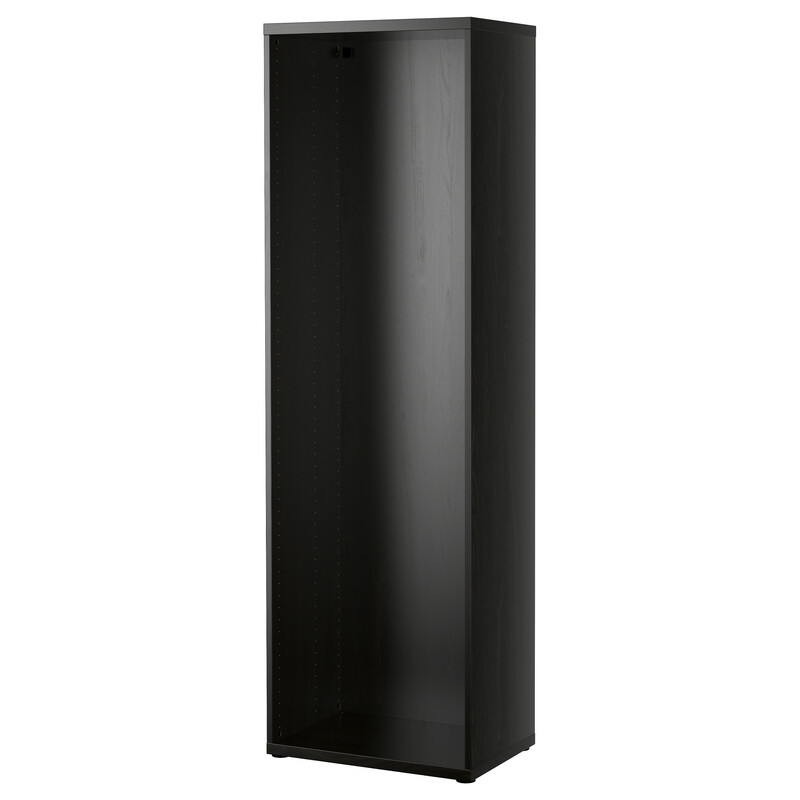 I just ordered 6 Besta cabinets and Striberg lighting for them. I haven’t ordered the glass yet because I’m hopeful that the fiskviken doors will be made available here in the United States soon. Your article has inspired some great ideas for my growing collection. I’ll post pictures on Sideshow when I have set the new cabinets up. Thank for such an informative article. Your YouTube videos are fantastic as well. Thanks a lot! I’m very happy to hear that you find it useful. First of all thank you for making this. I don’t know if you give advice, i will try to work my through this alone (but i’m bad at manual things). Again, thanks a lot for this, it’s beautifull ! Hi Gautier. I am sorry for the very late reply. I hope this reaches you and that it is still helpful. You can fixate the cabinet to the wall (which is certainly a must) with some L-shaped metal fixators. They come with the cabinets. There is certainly a weight capacity to these shelves. Remember that one thing is the shelf itself, another thing is the small hinges that actually support the shelf. I would be cautious exceeding the weight capacity if the shelves. You can read this from the product page over at IKEA. I would stay below that capacity. However, this makes it a bit more difficult to display newer statues as they are often quite heavy. 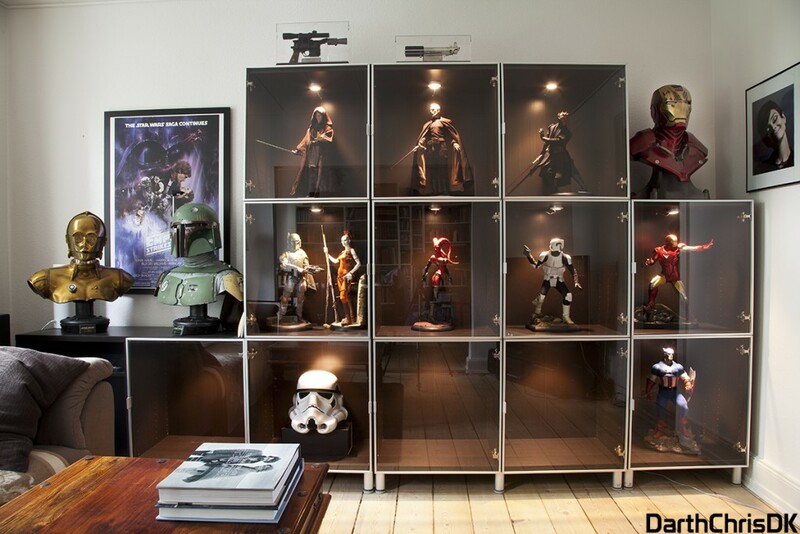 I’d put the heavy pieces in the bottom unit. At least, that’s what I have done. Hi there. I am sorry for the very late reply. Do you mean the shelves? I have a few statues that say they are 15 or 16 inches long (deep), will these fit as I would like to use glass to cover them or would it be sticking out? Death trooper is the biggest one I’m nervous about. Thanks! Hi Travis. I think that those measurements won’t fit 100% with BESTA shelves. I believe them to be around 14 inches in depth. Depending on the statue, it would require rotating it a bit, unless 15-16 inches is the absolute lowest depth depending on rotation. When I had my Hulk PF displayed inside, I only had one specific angle that would make him fit inside. He was less than a quarter inch from touching the glass door.